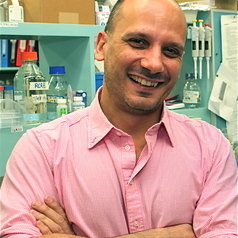 Dr. Bertolino graduated from the University of Lyon in France and then trained as a post-doctoral fellow at the Walter and Eliza Hall Institute in Melbourne (1992-95). He then moved back to France at the ENS-Lyon (1995-97) before settling in Sydney at the Centenary Institute in 1997. Dr. Bertolino is internationally recognised as a world-leading expert in Liver Immunology. He has made major contributions related the ability of the liver to induce tolerance in transplantation, and chronic HCV infection. His group uses transgenic mouse models, advanced imaging technology and flow cytometry to understand how T cells interact and are instructed by liver cells in both the healthy and diseased or transplanted liver.